Softcover version of this ebook is available on Amazon here! As a busy stay-at-home mom, I wanted a basic monthly planner that I could use to keep track of our days. It seems like many planners today have so many extra pages in them that I get lost and confused trying to use them. What I really needed was simply a basic monthly planner that held monthly calendars on a 2-page spread, plus some extra pages in the back for additional notes or lists. So, I created the Intentional Monthly Planner! While these calendars can be used to keep track of events, appointments, birthdays, etc., I plan on using them to track our homeschool work. Yes, I am a homeschool mom as well and have four children that I am still homeschooling. My plan is to use one planner for each child. For my younger children, I will write what we do each day onto the monthly calendars. Some work will be planned out ahead of time and other things will be written in at the end of the day. 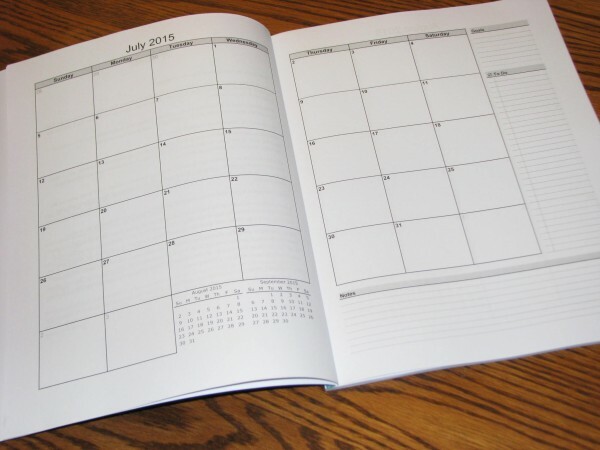 Older children can use the planner to plan out their own schedule. Additional space is provided on the monthly calendar pages for to do lists, goals, or notes. Lined pages are included at the back of the planner for any other items you may want to record. Since I am using these for homeschooling, I plan on have a list of books read, curriculum used that year, field trips taken, and any other special things I want to record about the school year. If you want to read about how I have used the Intentional Monthly Planner to plan out our homeschool year, click on over to this post.